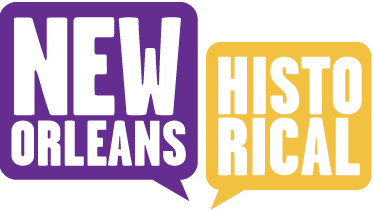 On a February night, a crowd lined St. Charles Avenue from Lee Circle to Louisiana Avenue, twenty-five blocks, to witness a procession of lanterns floating like a swarm of fireflies up the darkened street. First came the bandwagon, pulled along by four horses led by the famous acrobat and vaudeville theater magnate Signor Faranta. And behind that came seventy of those novel, wheeled machines that had appeared on the city streets seven years before. Perched four feet from the ground on their high wheel bicycles came the costumed “Romeo,” and behind him Mephistopheles astride flapping wings of red, and parasols and umbrellas fringed round with multi-colored lights, a ship with its signal lights burning, a page, and a soldier. Dressed as The Mikado, the Grand Marshall appeared on a tricycle illuminated by eighteen Chinese lanterns and covered by a twelve-foot Japanese umbrella, from which dangled fifty Chinese jewels. Nanki Poo and his Mandarin friend rode together on a tandem tricycle, its large wheel interwoven with gold and silver sunfish, topped with a Chinese pagoda fourteen feet across, fifteen feet high, and graced with six dozen lanterns in crossing arches. And behind them came more in costumes: a man dressed in black with the figure of a human skeleton outlined in white; a young man dressed as a ballerina; devils, jockeys, princes, harlequins; silk, velvet, and glitter all displayed in a procession on wheels. 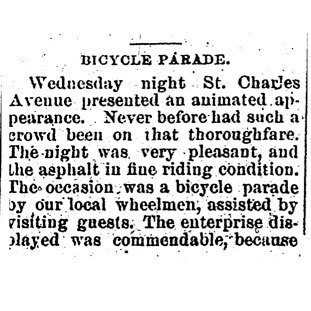 This fairy spectacle was the Carnival bicycle parade held on Ash Wednesday, 1887. 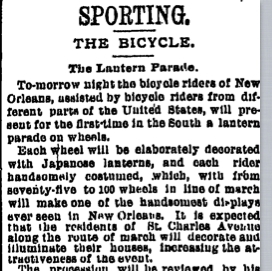 The parade, organized by the New Orleans Bicycle Club and put on by cyclists from New Orleans and cities all over the South, had been planned for the Monday before Mardi Gras and billed as a main feature of that years’ Carnival. Pouring rain on Lundi Gras forced the postponement. Despite the awkward date—normally a day of quiet sobriety—Rex and his queen watched from a balcony and applauded the luminous scene, as did the crowd along St. Charles Avenue. Almost every house was lighted up and many of the balconies decorated for the event. 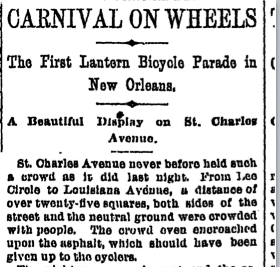 And yet, only seven years before bicycles were considered by the people of New Orleans an unwelcome intrusion: the riders undignified and the vehicles a menace that did not belong on the streets. 1887 was the year they were convinced otherwise. Lacar Musgrove, “Carnival on Wheels, 1887,” New Orleans Historical, accessed April 24, 2019, https://neworleanshistorical.org/items/show/564.